Shirley Faye Cox was born June 28, 1927 at Latonia, Kentucky. The daughter of Arthur Burke Cox, Sr. and Bertha Anne (Lambert) Cox. She graduated Shawnee High School, Louisville Kentucky with the class of 1946. She attended Faith Bible College in Ankeny, Iowa. On February 21, 1947, she was united in marriage to Alfred William Flack at Louisville, Kentucky. To this union three children were born: Michael, Mary Lynn, and Martin. She was employed as a bookkeeper for Ed Foster and Joe White in the feed store, and also with Ralston Purina, Iowa Falls. She was later a credit authorizer for Sears Credit Central, Des Moines, Iowa retiring in 1988. 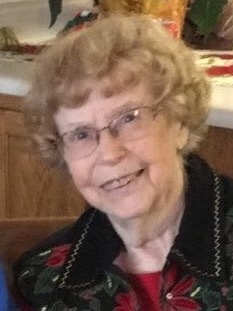 She was a member of the First Christian Church (Sunday School teacher), Iowa Falls, the Iowa Falls Federated Garden Club, the Iowa Falls Culture Club, and Christian Women’s Club. She had a bible study in her home for many years. Shirley Faye Flack is survived by her children: Michael R. (Linda) Flack of Ackley, Iowa, Mary Lynn (Rodney) Lee of Austin, Minnesota, and Martin E. (Christine) Flack of Grand Rapids, Michigan. Seven grandchildren, eight great-grandchildren, and a sister-in-law, Clara Mae Flack of Colo, Iowa and numerous nieces and nephews. She was preceded in death by her parents Arthur and Bertha Cox and six brothers: Orville, Cecil, Donald, Ralph, Arthur “June”, and David.